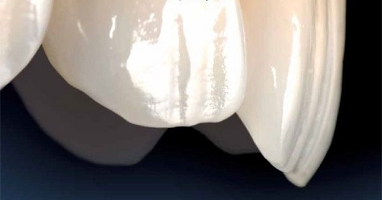 The IPS Empress material is made of an extremely homogeneous leucite-based ceramic, which scatters lightlike natural enamel and blends in well with its surroundings. Restorations fabricated with the material exhibit lifelike translucency and a true-to-nature appearance. As the press ceramic IPS Empress Esthetic is based on the same material composition, the product demonstrates exceptional light-optical properties and a strength value of 160 MPa. The highly aesthetic all-ceramic single tooth restorations, such as inlays, onlays, crowns and veneers blend in seamlessly with the surrounding dentition.